Visit Workopolis online at Workopolis.com for the connection that clicks you into the right job. Workopolis understands there’s a world of difference between finding a job and finding the right job. Workopolis provides a range of tools to make that right connection ASAP. Join the over 4 million users and find your job match with Workopolis.com. Save money with Workopolis discounts, Workopolis coupons and Workopolis savings from 58Coupons.com. Don't miss out on the job packages on Workopolis.com where you can save 25% with the purchase of the National Super Starter Pack which includes 1 job posting, 1 bolded job credit and 1 featured job credit for only $803. Buy 1 job posting and a 2-week subscription to Resume Database from Workopolis.com and save $438. Click link to enjoy this Special Offer. Act now and you can save up to 50% per job when you purchase multi-paks from Workopolis.com. Check out Workopolis.com and you can preview their resume database for Free. 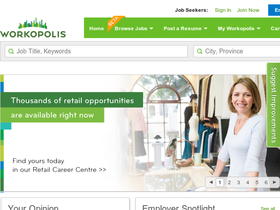 Check out Workopolis.com and you can search over 2 million resumes. Find your next employee with the resume database on Workopolis.com, now only $875.